Thornton et al. (1) reported recently that in both mouse and man, ∼70% of peripheral Foxp3+ regulatory T cells (Tregs) express the transcription factor Helios. Interestingly, they found that Foxp3+ cells generated in the thymus all coexpressed Helios, whereas Tregs generated in vitro from conventional peripheral T cells with anti-CD3 and anti-CD28 Ab stimulation in the presence of IL-2 and TGF-β1 do not express Helios. This, they suggested, could mean that ∼70% of Foxp3+ Tregs in the periphery are thymically generated, and 30% are derived from peripheral conversion of conventional T cells. Using the same Ab, we found that of peripheral Foxp3+ Tregs in the B10.PL mouse ∼70% express Helios, whereas in the TCR transgenic Tg4 mouse, this number is increased to ∼90% (data not shown). We next used Rag-deficient Tg4 mice, which do not have natural Foxp3+ cells, to induce Foxp3 expression in CD4+ splenocytes with the natural ligand for the Tg4 TCR, MBP Ac1-9 (ASQKRPSQR) peptide, in the presence of IL-2 and TGF-β1, using irradiated non-CD4 cells from the same mouse as APCs. In contrast to what we expected, ∼50–60% of induced Foxp3+ cells coexpressed Helios (Fig. 1A). 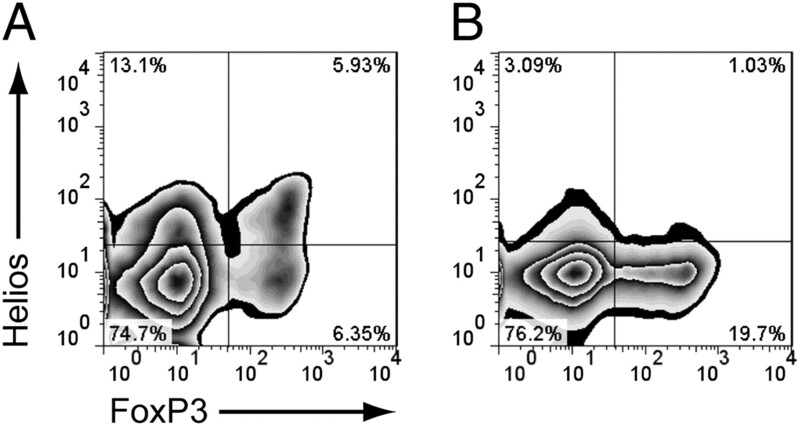 When plate-bound anti-CD3 and anti-CD28 Abs were used instead of peptide to induce Foxp3 expression in the same cells, Helios expression remained low or absent (Fig. 1B), similar to the results presented by Thornton et al. (1). The method of activation rather than the origin of the Foxp3-expressing cells, therefore, appears to determine Helios expression. It remains to be elucidated if Foxp3+Helios− T cells in vivo represent induced Tregs in nontransgenic animals. Helios expression by in vitro induced Tregs. CD4+ T cells from spleens of Tg4 Rag−/− animals were stimulated for 72 h with either 0.01 μg/ml MBP Ac1-9 peptide and irradiated non-CD4 splenocytes (A) or plate-bound anti-CD3 and anti-CD28 Ab (B), in the presence of 100 U/ml rhIL-2 and 5 ng/ml recombinant human TGF-β1. Anti-Helios (clone 22F6; Biolegend, San Diego, CA) and anti-Foxp3 (clone FJK-16s; eBioscience, San Diego, CA) staining performed using the eBioscience Foxp3 staining buffer set. Plots are gated on CD4+ cells.
. 2010. Expression of Helios, an Ikaros transcription factor family member, differentiates thymic-derived from peripherally induced Foxp3+ T regulatory cells. J. Immunol. 184: 3433–3441.